Some of Ireland’s favorite tipples – from the strong stuff to red lemonade. For centuries Ireland has produced world renowned beverages which are distributed throughout the world. A nation famous for Guinness, obsessive tea drinkers and some of the best whiskey in the world, Ireland’s indigenous beverages offer a varied selection for any drinker. 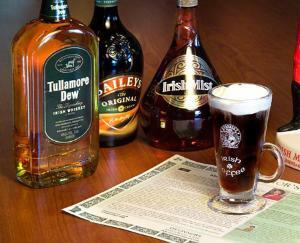 There is no escaping the impact beverages such as Guinness and Baileys have had on the global market. It is rare to travel any to any location in the world and not be greeted by the familiar sight of an Irish drink. We have even included some of our childhood favorites that we all love to crave! Like silk being poured into a glass, Guinness is one brand which is synonymous with Ireland. In 1759 Arthur Guinness acquired a four acre site and signed a 9000-year lease for the St. Jame;s Gate Brewery in Dublin. The brewery became well known for brewing “porter” which was a dark ale. Over the past 250 years his dark ale has evolved in to an unique dark stout which is enjoyed across the globe. According to the company over 10 million glasses of Guinness are enjoyed daily around the world. Ireland is home to several distilleries which produce some of the world’s finest whiskeys. Uisce Beatha is the Gaelic term for whiskey which translates to “water of life”. The most common types of whiskey distilled in Ireland include single malt, single grain and blended whiskey. Examples of Irish whiskey include Black Bush, Bushmills, Jameson, Paddy, Powers, and Tullamore Dew to name a few.